(Kelly Lehr) Koston Szafranski from The Danger Noodles takes possession of the puck during Boulder City Parks and Recreation Department's youth hockey league for third- through sixth-graders. The Parks and Recreation Department’s adult women’s volleyball league began its season March 11 with six teams competing for the top spot. Former league champions, The Amazons, and I’d Tip That won their games with big net play from Diana McCall from I’d Tip That and Noelle Milicic from The Amazons, according to Kelly Lehr, sports coordinator for the department. Games are played in the new gymnasium at the recreation center, 900 Arizona St., at 6:30 p.m. Mondays. The league continues through April. 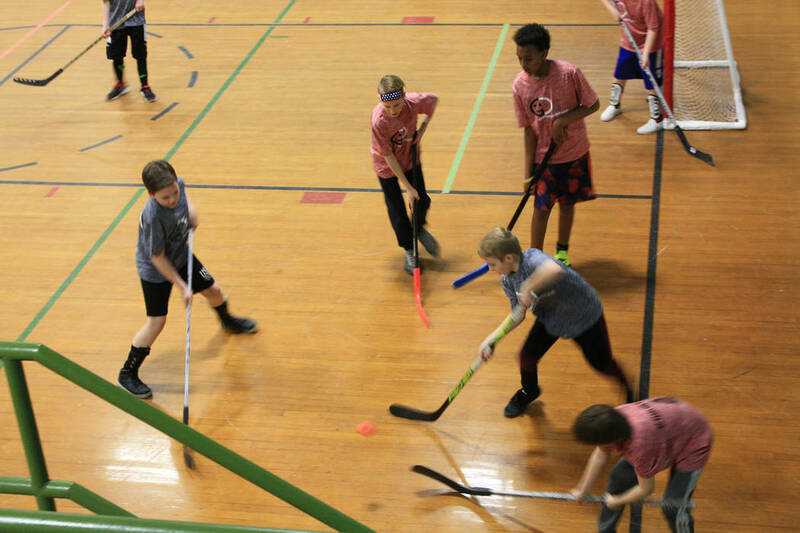 Boulder City Parks and Recreation Department’s third- through sixth-grade indoor hockey program began league play last week in the old gymnasium at the city’s recreation center on Arizona Street. Six teams, all sponsored by Gibson Orthodontics, are participating in the 5½-week program. The children play on Monday and Wednesday evenings through April. The adult coed and men’s softball leagues have a manager meeting at 7 p.m. today, March 21, at the recreation center, Games will begin next month and be played at the ball fields at Hemenway through June. The Parks and Recreation Department is accepting registration for its upcoming T-ball, coach pitch, softball and baseball programs. Clinics will be held Saturday, April 6, at ball fields at Hemenway Valley Park, 401 Ville Drive. The season runs May 9 through mid-June.